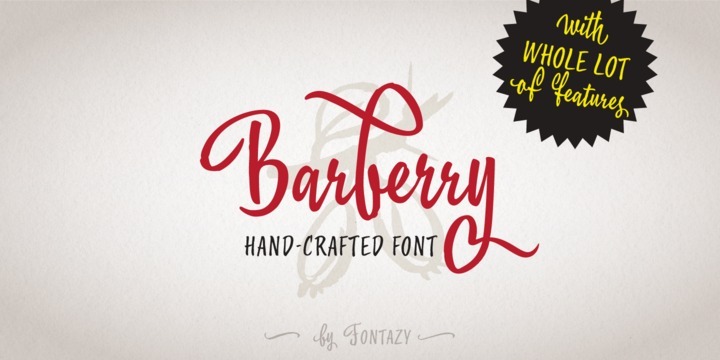 Barberry is a handmade typeface created by Zakhar Yashchin and published by FontaZY which comes in two weights but with whole lot of features. It is characterized by original letters, swash, ligature, initial & final alternate, titling alternate, small caps, stylistic alternate and vigniette. Also it has over 1400 glyphs, latin & cyrillic ligatures, over 200 icons & vigniettes and multilingual support. It is ideal for any kind of project such as: advertising, headline, logo, packaging, poster, sign painting, wedding and so on. Have fun! A font description published on Friday, December 16th, 2016 in FontaZY, Fonts, Zakhar Yashchin by Alexandra that has 3,320 views.